ClubCoins Needed: 110 Please note that this item is not available on your device. You may add the item to your Wish list and redeem from a compatible device. FROM THE MASTER OF PERSONAL POWER -- A DATE WITH DESTINY... "e;I know that no matter where you are in your life, you want more! No matter how well you're already doing or how challenged you now may be, deep inside you there lies a belief that your experience of life can and will be much greater than it already is. You are destined for your own unique form of greatness..."e; Anthony Robbi… ns already has unlocked the personal power inside millions of people worldwide. Now in this revolutionary new audio production based on his enormously popular Date with Destiny seminars, Robbins unleashes the sleeping giant that lies within all of us -- teaching us to harness our untapped abilities, talents and skills. 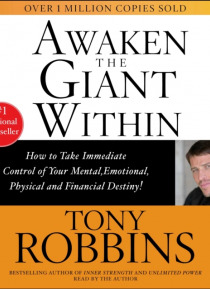 The ultimate program for improving the quality of every aspect of your life -- personal or business, physical or emotional -- Awaken the Giant Within gives you the tools you need to immediately become master of your own fate.